Walt Disney Pictures has released a new, full-length trailer for Selma director Ava DuVernay's adaptation of the Madeleine L’Engle's much beloved 1962 novel "A Wrinkle in Time". The story follows Meg Murry (Storm Reid), her brilliant brother Charles Wallace (Deric McCabe), and their friend Calvin (Levi Miller) on an unexpected journey into alternate dimensions on a mission to bring their father (Chris Pine) home. 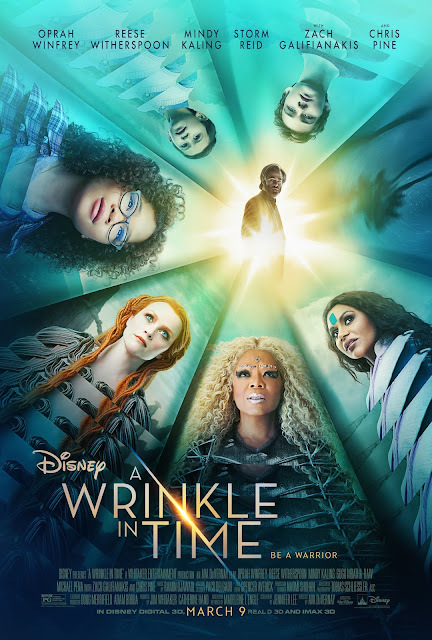 The film has certainly assembled a strong cast as Oprah Winfrey (It feels so strange having to type her full name), Mindy Kailing, and Reese Witherspoon are highlighted both in the trailer and new poster (see below) as three chimerical celestial beings who help Meg “wrinkle” time and space. Though somewhat difficult to get a grasp on the meanings and impressive nature of what DuVernay has brought to life here given I have no frame of reference it is after seeing this new trailer that I look even more forward to establishing one. There is almost nothing I love more about the movies than walking into a film that is so boldly a science fiction/fantasy that builds its own world unabashedly as it seems DuVernay has done here. With A Wrinkle in Time it seems DuVernay was given the keys to a kingdom she's always desired to explore and so, to be able to witness this opportunity come to fruition will no doubt be something rather remarkable when the film is released next Spring. Selma was the best film I saw in 2014 (though it technically received a wide 2015 release) and so, without even knowing what type of film DuVernay would be tackling next there was anticipation to see where the filmmaker's career would go and to see it not only go in a direction that is rather unexpected, but also in such a potentially special direction is all the more assuring. Visually, this thing looks wonderful and the cast all look as if they're really tuned in to not only delivering a final product that is a fun experience and beautiful to look at, but meaningful as well. I'm in the bag and officially cannot wait. Definitely one of my most anticipated films for 2018. A Wrinkle in Time also stars Gugu Mbatha-Raw as Mrs. Murry, Zach Galifianakis as The Happy Medium, André Holland as Principal Jenkins, as well as Bellamy Young, Rowan Blanchard, Will McCormack, and will open on March 17th, 2018. Synopsis: From visionary director Ava DuVernay comes Disney’s “A Wrinkle in Time,” an epic adventure based on Madeleine L’Engle’s timeless classic which takes audiences across dimensions of time and space, examining the nature of darkness versus light and, ultimately, the triumph of love. Through one girl’s transformative journey led by three celestial guides, we discover that strength comes from embracing one’s individuality and that the best way to triumph over fear is to travel by one’s own light.